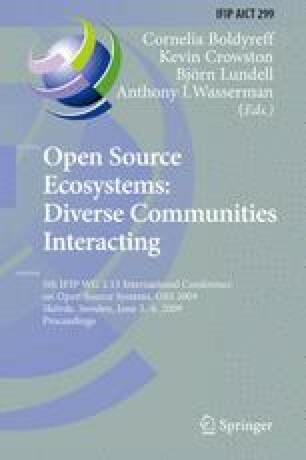 According to the now widely accepted “onion-model” of the organization of open source software development, an open source project typically relies on a core of developers that is assisted by a larger periphery of users. But what does the role of the periphery consist of? Raymond’s Linus’s Law which states that “given enough eyeballs all bugs are shallow” suggests at least one important function: the detection of defects. Yet, what are the ways through which core and periphery interact with each other? With the help of text-mining methods, we study the treatment of bugs that affected the Firefox Internet browser as reflected in the discussions and actions recorded in Mozilla’s issue tracking system Bugzilla. We find various patterns in the modes of interactions between core and peripheral members of the community. For instance, core members seem to engage more frequently with the periphery when the latter proposes a solution (a patch). This leads us to conclude that Alan Cox’s dictum “show me the code”, perhaps even more than Linus’s law, seems to be the dominant rule that governs the development of software like Firefox.